U.S. stocks slumped on Monday, as warnings from Caterpillar Inc (CAT.N) and Nvidia Corp (NVDA.O) added to concerns about a slowing Chinese economy and tariffs taking a toll on corporate profits. Nvidia tumbled 13.8 percent after the chipmaker cut its fourth-quarter revenue estimate by half a billion dollars on weak demand for its gaming chips in China and lower-than-expected data centre sales. Quite right. 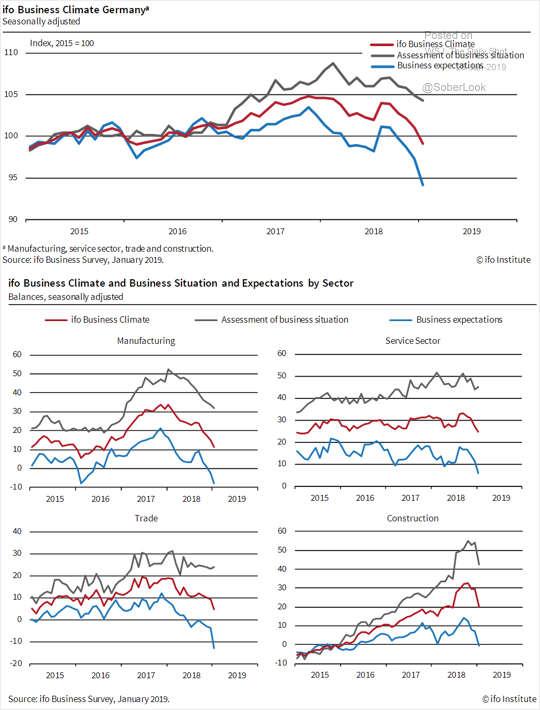 My view is we’re headed towards closer to 2% global growth in H2, 2019, led lower by fading Chinese growth, the US fiscal cliff and a European recession. The European Central Bank is ready to use all its policy tools to support Europe’s softening economy, including by restarting a recently shelved bond-buying program, ECB President Mario Draghi said. The comments, delivered to European lawmakers in Brussels, underscore a new tone of caution from the ECB, which moved only last month to phase out its landmark stimulus policy, a €2.5 trillion ($2.9 trillion) bond-buying program known as quantitative easing or QE. China has not done enough either to turn around growth and it will need to cut the cash rate to do it. In other words both the ECB and PBOC are going to have to trash their currencies. For the time being, markets are obsessing over the US but it remains in decent shape post-shutdown. 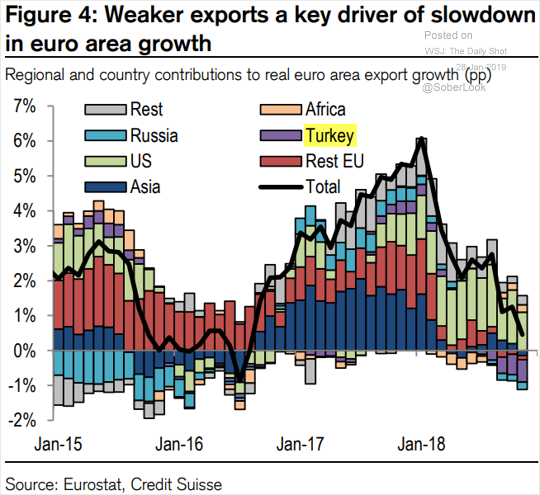 The Fed has been bashed into easing up by the White House but both China and Europe are going to have to ease much more aggressively if they’re going to turn growth. Ironically, such will prevent the USD from falling which in turn will keep global liquidity tight until or unless US growth also falls over. This will add ongoing downwards pressure to commodities and the AUD. Hmm. There is still that pesky view that the AUD is “as good a place as any” to stash money in the event of global weakness “because China will always stimulate eventually”. Should be ‘Because China, ECB, BoE, FED BOJ, will ALL stimulate in the end and Aus looks like a good place’. Our little economy is a tiny cork on this ocean and it will get washed wherever the big waves push it. The housing market bust and smashed A$ is still not a one-way bet. As long as we run with the stunningly moronic economic meme that we have operated in for the last 40 to 60 years the interests of this country and its people run a very poor last to the interests of the rest of the world. BTW The click-bait headlines are tiresome. What’s written in the article is pretty good and totally at odds with the headline. China will stimulate periodically, for sure, circling the plug-hole as they are. However, there is both empirical evidence (as well as sound theory) that says the impact of each round of stimulus decreases (the law of diminishing returns). Added to which, each round of stimulus simply brings China closer to economic catastrophe as their debt pile is increasingly unserviceable and their currency increasingly worthless. All looks fine now, but one day they’ll arrive at an inflection point and it’ll be the end for them. 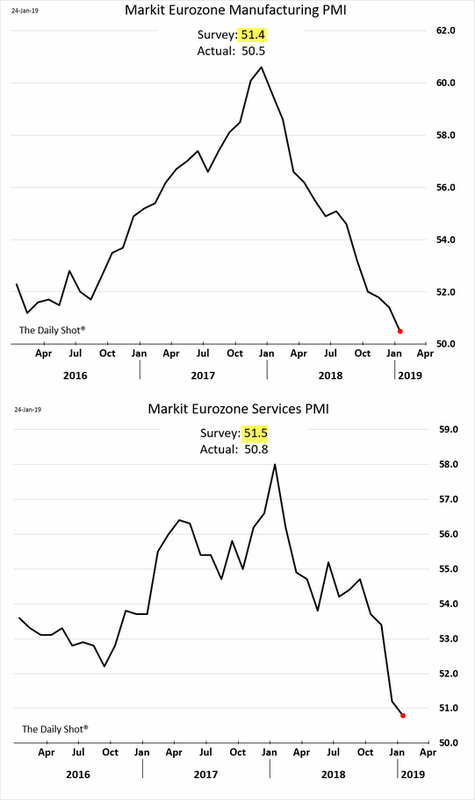 Say the ECB start printing a few Trillion, the FED prints a few trillion, the rest chime in, then Australia’s CAD and debt are not going to look like much of a concern. From memory, when the ECB printed last time about 40% of the funds printed left the EU. The US sprays money all over the world all the time. The MMT clowns are right. We can print all the money we need !! Bwahahahaaa!!!! The problem is that no one can begin to imagine that life could be materially different from the one they’ve experienced over the past 30 or 40yrs and the life they see waking up this morning. Sure, there might be economic ‘soft patches’ from time to time but otherwise things will just continue as they have been in recent memory. It is ingrained the psyche that house prices will always go up and that future generations will be wealthier than past ones. Yup!!! My train of thought has always been – major economic dislocation followed closely by social dislocation and major civil disturbance. Dictators and wars follow. “Dictators and wars follow.” – that is how I see it. We already have them (dictators) and in some countries where people think they are free to chose. Some countries will not try to mask it and some already are masking it where population can only chose one of two while both candidates, behind the curtain, report to the same machine. My tinfoil hat tells me exactly that. My evidence, oten quoted sorry, is Barnaby and Bowen each having a crack at foreign debt at one stage. Virtually overnight (in Barnaby’s case it happened overnight I can attest) they each went absolutely silent on the issue and it has never been raised again by either of them. Will be very interesting to see how Friday’s 3.75% 2037 bond tender goes…….only $400 million on offer all week. So if the Fed and ECB start buying bonds again, how will that impact stock and asset markets? Will we get a return to normal? 2015 / 2017 price rises or with it just stem the bleeding? The gazillion dollar question. Asset prices to bubble to the moon again? Given that QE as tool to ‘fix the economy’ has been an abject failure its only real use can be to goose asset prices. Printing money may push the indexes up but it’s the value of the currency in which your assets are denominated that counts. As Venezuela entered its hyper-inflationary phase in recent years the Caracas Stock Market was the best performing on the planet (by a country mile). That, in a nutshell, is what you need to know. As Kyle Bass might opine: your nominal returns are measured in 1000s of percent but your entire portfolio would buy you three eggs. Unless your portfolio contained gold. Pretty sure the Venezuelan govt would have found a way to confiscate that! All the major central banks will ease, including the Fed. Europe might be obviously stuffed, but the US economy is weakening as well. It will make life easier for everyone if the Fed starts monetary easing first. QT will end sometime in 2019, and the next move is a rate cut. Just sold all my physical gold.. Perth Mint was charging me too much storage fees. Hope price will drop again so I can buy some from Perth Mint authorised dealer in Syd and store it privately. I do want to have some physical as back up for just in case. Made decent profit, more than keeping the cash with ING. Though I do plan to move half the money back with ING. Why not just take delivery? wasn’t cheap either. Now, I just hope gold does not spike to the roof while I have none. I have some cash to start buying dips if there are any.. as AUD may start falling too. Depends on where you live. It’s nuts that the only ‘Mint’ is in Perth. From Brisbane, flying over and back costs $800 or more even on a one day return. Delivery charges are ridiculous. WSo you need to be buying a fair whack to make it worthwhile. Then you have to find a way of storing it where nobody can find it. Expensive?! It’s $20 a kilo. Where do you buy physical gold and how do you know it’s really proper and not fake gold? They do fully insured delivery. Perth Mint has authorised dealers that I hope will not sell sh1te but mate unless you can drill and test the actual item.. Another option is if you happen to fly to Perth you can arrange pick up from Perth Mint. buy less than $5k at a time or KYC kicks in. Thanks bda – good info. there are also the forums at silverstackers.com.au but you’re faced with paying up front and no XRF / assurances. but you can usually buy cheaper than from a dealer..
You can buy from perthmint and store it allocated there for you in its own little hidey hole for 1% PA.
AU$ gold has been increasing 7% PA for over 10 years. Buy bullion from a dealer in the CBD and stick in your safe at home ? Or get a deposit box at a bank ? Or seal it in PVC and bury it in he vege patch – then hope you get to dig it up before you get too old to remember where you put it! the correct location is usually in your boat, at the bottom of a lake or ocean. Or just buy $US. Convert back to $Au when it hits 60. Nickola – Why would you want to own physical gold at this stage – banking and financial systems are still working. Why wouldn’t you just hold a US ETF such as GLD? Thing is you won’t get any warning when a bank holiday comes, you won’t have time to do anything. AI answered it. Now plan is to buy 20 Oz of gold and stash it somewhere save. This would be my survival kit. Graham- US tax on gold and physical gold ETFs is quite heavy compared to their tax on other capital gains. if you’re buying as a cash replacement you may want to consider fractional purchases and some silver + fractional. it’ll be a challenge to get change out of a $2000 coin. My Gold is doing very well now….finally! I topped up last week, so rather pleased. my best metal has been iridium, bought it when at $700 USD/oz. only a few oz though. waiting for that silver moonshot. Hoping the trifecta works more, dollar down, gold up, houses down.